The Bakun Dam with overflow and power turbine installation. Home of the Kenyah native people who once lived in Long Geng, which was flooded by the Bakun Dam. Their community is now dispersed between Sungai Asap, Long Lewan and floating longhouses on the Bakun reservoir. Bakun Belaga region, Sarawak Borneo 2012..Borneo native peoples and their rainforest habitat revisited two decades later: 1989/1991-2012. 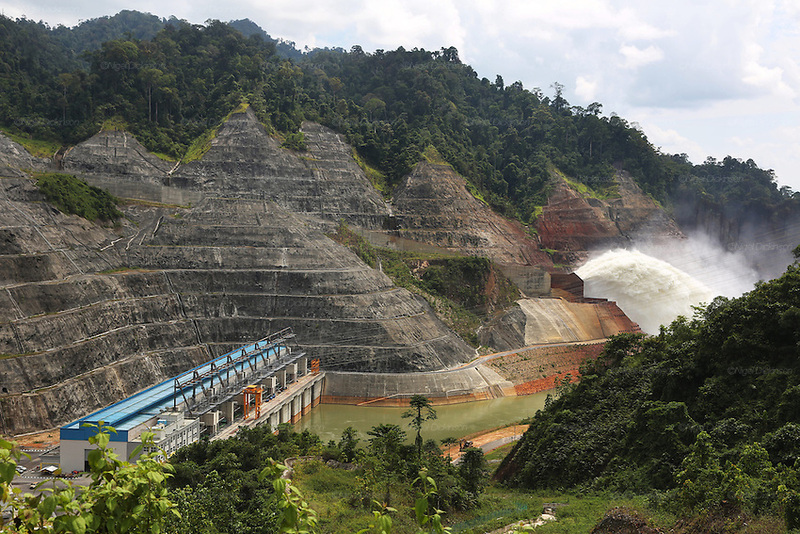 ..The Bakun hydro-electric dam, which covers 700km². Construction of the dam required the relocation of more than 9,000 native residents, mainly Kayan and Kenyah indigenous peoples who lived in the flooded area. Many Sarawak natives have been relocated to a longhouse settlement named Sungai Asap in Bakun. Most of them were subsistence farmers. Each family were promised only 3 acres of land, insufficient to survive, and many families still have not been compensated for the loss of their longhouses..Sarawak's primary rainforests have been systematically logged over decades, threatening the sustainable lifestyle of its indigenous peoples who relied on nomadic hunter-gathering and rotational slash & burn cultivation of small areas of forest to survive. Now only a few areas of pristine rainforest remain; for the Dayaks and Penan this spells disaster, a rapidly disappearing way of life, forced re-settlement, many becoming wage-slaves. Large and medium size tree trunks have been sawn down and dragged out by bulldozers, leaving destruction in their midst, and for the most part a primary rainforest ecosystem beyond repair. Nowadays palm oil plantations and hydro-electric dam projects cover hundreds of thousands of hectares of what was the world's oldest rainforest ecosystem which had some of the highest rates of flora and fauna endemism, species found there and nowhere else on Earth, and this deforestation has done irreparable ecological damage to that region.